Eltronicschool. - This is one of the battery charger circuit which will helpful for you to build yourself battery charger using popular component. In here we will show you circuit schematic of battery charger based on SCR component like 2N3668 that maybe easy found in your country. In this time, beside we will give you the schematic diagram of battery charger using SCR 2N3668, we also will give you global component parts and description about this circuit schematic according the information from the site which published this circuit. 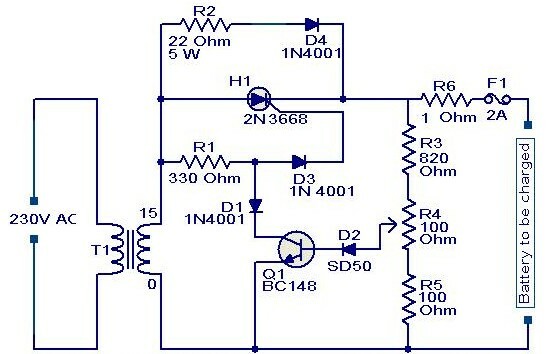 Circuit schematic like in Figure 1 above is Battery Charger circuit using SCR 2N3668. The main component is used in this circuit is SCR 2N3668 which functioned to rectify the AC mains voltage to charge the battery. According Circuitstoday site describe how the circuit work as follow that When the battery connected to the charger gets discharged the battery voltage gets dropped.This inhibits the forward biasing voltage from reaching the base of the transistor Q1 through R4 and D2.This switches off the transistor.When the transistor is turned OFF,the gate of SCR (H1) gets the triggering voltage via R1 & D3.This makes the SCR to conduct and it starts to rectify the AC input voltage.The rectified voltage is given to the battery through the resistor R6(5W).This starts charging of the battery. When the battery is completely charged the base of Q1 gets the forward bias signal through the voltage divider circuit made of R3,R4,R5 and D2.This turns the transistor ON.When the Q1 is turned ON the trigger voltage at the gate of SCR is cut off and the SCR is turned OFF.In this condition a very small amount of charge reaches the battery via R2 and D4 for trickle charging.Since the charging voltage is only half wave rectified ,this type of charger is suitable only for slow charging.For fast charging full wave rectified charging voltage is needed.